By the time readers encounter academic history in the form of books and articles, all that tends to be left of an author’s direct experience with archives is pages of endnotes. Whether intentionally or not, archives have until recently been largely thought of as discrete collections of documents, perhaps not neutral but rarely considered to be historical actors. This book brings together top media scholars to rethink the role of the archive and historical record from the perspective of writing media history. Exploring the concept of the archive forces a reconsideration of what counts as historical evidence. In this analysis the archive becomes a concept that allows the authors to think about the acts of classifying, collecting, storing, and interpreting the sources used in historical research. 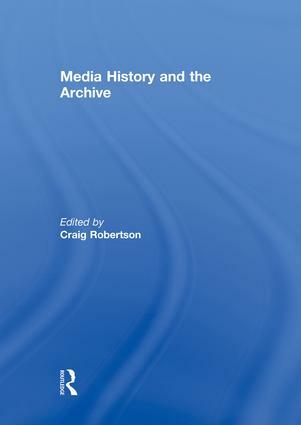 The essays included in this volume, from Susan Douglas, Lisa Gitelman, John Nerone, Jeremy Packer, Paddy Scannell, Lynn Spigel, and Jonathan Sterne, focus on both the theoretical and practical ways in which the archive has affected how media is thought about as an object for historical analysis. This book was published as a special issue of The Communication Review. Craig Robertson is an assistant professor in the Department of Communication Studies at Northeastern University. He is the author of The Passport in America (Oxford University Press) and the co-editor of Thinking With James Carey: Essays on Communication, History, Transportation (Peter Lang).